Two researchers at the University of Rochester have discovered the chemical that makes naked mole rats cancer-proof. Their research paper is being published today in the journal Nature. The findings could eventually lead to new cancer treatments in people, said study authors Andrei Seluanov and Vera Gorbunova. Naked mole rats are small, hairless, subterranean rodents that have never been known to get cancer, despite having a 30-year lifespan. The research group led by Seluanov and Gorbunova discovered that these rodents are protected from cancer because their tissues are very rich with high molecular weight hyaluronan (HMW-HA). 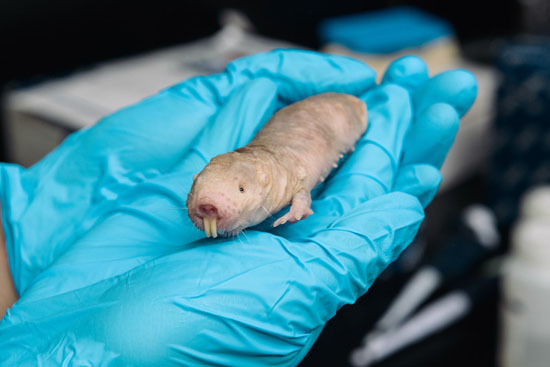 The biologists' focus on HMW-HA began after they noticed that a gooey substance in the naked mole rat culture was clogging the vacuum pumps and tubing. They also observed that, unlike the naked mole rat culture, other media containing cells from humans, mice, and guinea pigs were not viscous. "We needed to understand what the goo was," said Seluanov. Gorbunova and Seluanov identified the substance as HMW-HA, which caused them to test its possible role in the naked mole rat's cancer resistance. Seluanov and Gorbunova then showed that when HMW-HA was removed, the cells became susceptible to tumors, confirming that the chemical did play a role in making naked mole rats cancer-proof. The Rochester team also identified the gene, named HAS2, responsible for making HMW-HA in the naked mole rat. Surprisingly, the naked mole rat gene was different from HAS2 in all other animals. In addition naked mole rats were very slow at recycling HMW-HA, which contributed to the accumulation of the chemical in the animals' tissues. The next step will be to test the effectiveness of HMW-HA in mice. If that test goes well, Seluanov and Gorbunova hope to try the chemical on human cells. "There's indirect evidence that HMW-HA would work in people," said Seluanov. "It's used in anti-wrinkle injections and to relieve pain from arthritis in knee joints, without any adverse effects. Our hope is that it can also induce an anti-cancer response." "A lot of cancer research focuses on animals that are prone to cancer," said Gorbunova. "We think it's possible to learn strategies for preventing tumors by studying animals that are cancer-proof." Previous research by Seluanov and Gorbunova showed that the p16 gene in naked mole rats stopped the proliferation of cells when too many of them crowd together. In their latest work, the two biologists identified HMW-HA as the chemical that activates the anti-cancer response of the p16 gene. The research was supported by grants from the U.S. National Institutes of Health and the Ellison Medical Foundation. Hyaluronan (HA), which makes tissues supple and aids in the healing process, is found in high concentrations in the skin of naked mole rats. The biologists speculate that the rodents developed higher levels of HA in their skin to accommodate life in underground tunnels. Future research from the Gorbunova and Seluanov labs will focus on determining whether the HMW-HA from naked mole rats may have clinical value for either treating or preventing cancer in humans. This work was supported by grants from the US National Institutes of Health and Ellison Medical Foundation to Vera Gorbunova. Could this crazy creature help us cure cancer?